Good quality plastic, will hopefully last a while. When the sun comes out and all the children venture outside, let their imaginations run wild with our brightly coloured Boat Set. The perfect accessories for play in sand or water, these 20 individual boats have been designed to help inspire their creativity and promote imaginative play in groups. Let them take their fleet down to find hidden pirate treasure or take the opportunity to teach them about the maritime history of your town using these engaging toys. 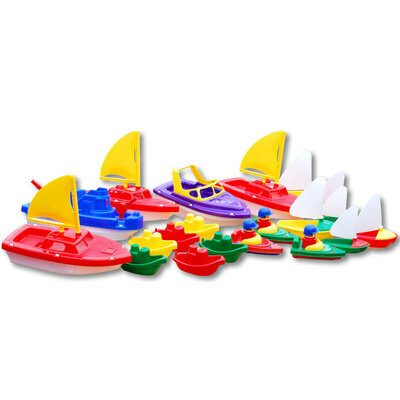 With their all plastic constructions, each of these boats is hard wearing and easy to sanitise after play while also storing away with other outdoor toys for the next sunny day. Suitable for small children, add a spark to their next playtime with this appealing set. Your outdoor play sessions will move to a whole new level when you introduce our Bumper Moulds Set 40 pk or our Sand Grabber Pack. And if you choose to bring this play indoors, our Exploration Circle with Stand or Sand & Water Clear Tray make the perfect standing play areas.